New Year's Eve is an exciting time of year for students to look back at what they've learned. While your kids wait for the clock to strike midnight, keep them learning with these New Year's Eve worksheets. From DIY confetti and hats to more educational options, we have you covered with worksheets for students of all ages. The fun isn't over on January 1; Chinese New Year worksheets are right around the corner. Color and cut out your very own New Year's Eve party hat! Have your little ones decorate it with glitter and ribbons to make it even more festive. Color in an elegant New Year's masquerade mask to get into the new year cheer. 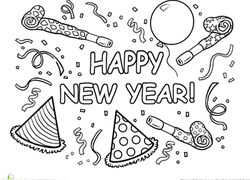 Ring in the new year with a printable project for your little learner! This mini-book is packed with fun activities to celebrate the season. 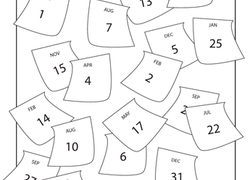 Get your child excited about the new year with this New Year's calendar maze. Your child will find a way through the calendar pages from 2009 to 2010!